May 5, 2011 This post may contain affiliate links. my hand is twitching and tingling and needs a break. Please, let me have a break soon. In the last month, I’ve made over 500 cupcakes. Oh yeah, and I’ve eaten exactly 0. Zero. Zilch. Nada. Go me!! Go me!! I’m a sucker for lemon anything, but top it with raspberry buttercream and I might actually groan while I eat it. But I didn’t… these cuppies are on to bigger and better things. And I’m scared to death to see how they turn out. Last March I was contacted to do wedding cupcakes for a wedding that’s happening this Saturday. I didn’t give it a ton of thought… I’ve done wedding cupcakes before. Not too big of a deal. Then I saw their engagement photos. You have to click on this link to see these photos. It is worth it. They are stunning. Drop dead gorgeous. And fun. And really know how to pick a photographer. Who is also flying out to the East Coast to be at this wedding. Holy cow, I should not be involved in this at all. I’m seriously intimidated by all the talent that will be there and then there’s little old me with my little old cupcakes. Oh yeah, and it’s outside in her grandparent’s old sewing factory so there’s no AC and it’s buttercream. And it’s pretty far away from my house and somebody else is driving them there. I’m so nervous for my little sewing machines. But it’s done now. The cupcakes are all packaged up and waiting in the fridge. Along with another 85 cupcakes that are getting sent to the kids’ school tomorrow for the end of Teacher Appreciation Week. Sorry, teachers… no special toppers for you. Remember, my hand is tired. We did manage to get these made for the kids’ teachers. I borrowed this from Lil’ Luna. And a friend actually volunteered to package these up for me! Thank goodness, because we had 65 to do for the whole school! I found these at Domesticated Lady. Thank you! Wednesday was Milky Ways with a note that said “You’re out of this world!”. AND… I managed to get my first project done on time and submitted to the American Crafter contest that started this week at Nap Time Crafters! The voting starts tomorrow at 4 pm so please be sure to head over and vote! I’m kind of intimidated because there are some big bloggers out there as competition! But really crossing my fingers that people vote for the projects… whichever one that might be!! Beach Wedding Cake & Cupcakes! Wow! Those cupcakes and treats look amazing! I hope you’re giving yourself some sort of little treat tonight. Good luck tomorrow. I can’t wait to see what you’ve made. Fantastic! That’s all I can say… fantastic! Wow, you have so much more will power than I do, way to go. The sewing machines are adorable, and I am going to steal your A&W and swedish fish idea. 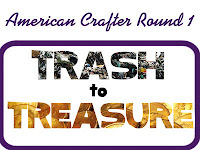 I loved your project on American crafter… I just wish I had room for a dress up closet in my house!